This year, 2012, the Creative New Zealand Randell Cottage Writers Trust celebrates its tenth anniversary. 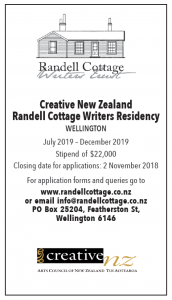 Since 2002, the historic Randell Cottage in Thorndon, Wellington, has been home to twenty writers in residence – ten from France and ten from New Zealand. Each writer has spent six months living and writing in the Cottage supported by the Trust which works in partnership with Creative New Zealand, the Embassy of France, and the New Zealand-France Friendship Fund. The celebrations will kick off on Tuesday 12 June at 7 pm with the AGM of the Friends of Randell Cottage at the cottage itself, 14 St Mary Street. On Tuesday 26 June, Wellington writer, Beverley Randell, whose family donated the cottage to the Trust, will give talks there on its history and preservation. Archive books and historical objects from the 1800s found under the cottage will be on display. Talk 1 will be at 4.30-6.00 pm and Talk 2 at 6.30-8.00 pm. All welcome. Entry is free, although a koha toward cottage maintenance would be welcome. Email info@randellcottage.co.nz to attend. The festivities will continue over three days in October starting with a special event on 4 October at the Wai-te-Ata Press to mark both the Trust’s tenth anniversary and the fiftieth anniversary of the Press. The reception will be jointly hosted by Randell Cottage Writers Trust, the French Embassy and Wai-te-Ata Press and will include the launch of Gnossienne, a limited edition poetry collection by former Randell writer Pat White, with artwork by Catherine Day, printed by Wai-te-Ata. Public readings by Randell Cottage writers in residence will be held at the Wai-te-Ata Press on Friday 5 October. On Saturday 6 October, the annual Randell Cottage Open Day will be held from 11 am – 4 pm, followed by a Garden Party at the Cottage. Pat White’s poetry and Catherine Day’s artwork will be on display at Wai-te-Ata Press until late October when it will move to Aratoi in Masterton until November 25. This year’s New Zealand writer in residence, the twenty-first author to live and work in the cottage, is poet, novelist and script writer, Vivienne Plumb who arrives in July. French author, Florence Cadier, has just returned to France after a successful summer in the cottage when she finished the manuscript for a young adult novel set in New Zealand. Find out more about the Randell Cottage history and the residency here.